We’d love your help. Let us know what’s wrong with this preview of wonder woman (1987-2006) #58 by George Pérez. War Of The Gods crossover #2. 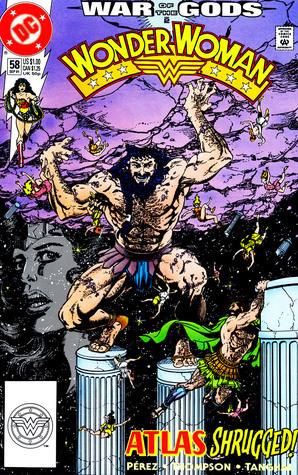 The mysterious Amazons continue to deceive the public, while Heracles encounters Atlas beneath Paradise Island in "Atlas Shrugged". Part 3 of 6, continued from the previous issue. Story continues next issue. To ask other readers questions about wonder woman (1987-2006) #58, please sign up. George Pérez (born June 9, 1954) is an American writer and illustrator of comic books, known for his work on various titles, including Avengers, Teen Titans and Wonder Woman.